Reading Game Over. Nice. HOWEVER, I thought you might like to edit in the details of my army, for completeness. If not, meh, ’tis your blog, you can say I brought an army of gayness and penguins if you like. Warlock Engineer 1 – Warlock-Augmented Weapon, Warpstone armour, Warp-energy Condenser. Warlock Engineer 2 – Warlock-Augmented Weapon, Pipes of Piebald, Dispel Scroll. 30 Clanrats – spears, shields, full command, Warpfire Thrower. 30 Clanrats – shields, full command, Ratling Gun. Rat Swarm – 5 bases. 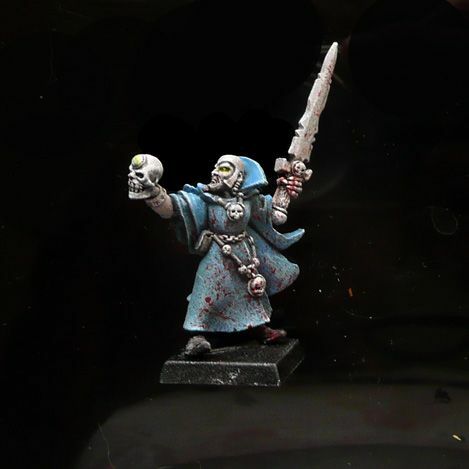 25 Plague Monks – full command, Banner of the Under-Empire. Incidentally, Shiny, yes, you do get the Face. You know that thing you do about where you spend whole minutes complaining about everything that’s rubbish about your army and what the others have that’s better/invincible, and greet every die roll with “as usual” and an eyeroll? That is the Face. Also incidentally, we’ve been talking about how to improve the Skaven army in the act of expanding to 2000 points. Maybe Shiny would like to write up his take on that conversation?